There are two options when you go camping Torre La Pena in Tarifa. There are two different campsites for tents or caravans at Torre La Pena I and Torre La Pena II as well as bungalows on these sites. The Camping Torre de la Peña was opened in 1968 allthough the Chozo Bar right on the beach front was allready opened in 1964.The inauguration of the Camping Torre de la Peña II, located only 100 m from the beach, took place in 1981. The Camping Torre de la Peña I has a saltwater swimmingpool with excellent views over the Strait of Gibraltar and extensive lawn to sunbathe and relax. The saltwater swimming pool of Camping Torre de la Peña II allows its visitors to relax in an enjoyable and quiet area, as an alternative to the nearby beach. There is a liveguard on site. The Chozo Bar is located right on the beach. 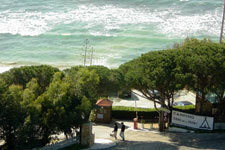 It is know for its incedible location and the fantastic views over the Strait of Gibraltar. The Camping Torre de la Peña II has a brand new childres´s playgroud where your youngest ones will have a great time. The playground was installed and certified to then strict standard of EU certification. The bungalows of the Camping Torre de la Peña I are unique with regards to their location. Spectacular views combined with a small and well-maintained garden guarantees an unforgettable stay. Excursions and activities may be organized by Camping Torre La Pena, such as visits to Morocco or Cádiz, bicycle rental, horseback riding, sailing, boat tours and more. Prices vary from just 5 euro during low season for just a tent pitch to 22 euro for a site for a camper van or car + tent. Discounts are offered for longer stays. just a quick thank you to marbella fun for a great recommendation! 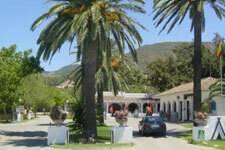 Enjoyed a fabulous weekend at Torre la Pena camp site in tarifa after seeing your article. Gracias!